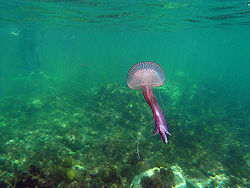 The Purplestriped jelly is a species of jellyfish known by the scientific name Pelagia noctiluca. Pelagia noctiluca, in Greek means, Pelagia- "of the sea" and nocti- light. This makes it obvious that all the jellyfish in this species is bioluminescent. 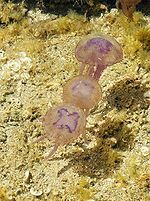 The purplestriped jelly in Europe is also known as the Mauve stinger. The jellyfish has distinct purple stripes and when developing lacks a polyp stage. This particular jellyfish is known to be bred in captivity and be put on display in aquariums. Other than being put on display, they serve no economic purpose, in fact, these types of jellys are what drive people from the beaches and have caused economic problems in the past. The full grown adult purplestriped jelly fish has distinct stripes. The bell of the jellyfish can grow to become seventy centimeters in diameter. The purplestriped jellyfish has radial symmetry. It has four large oral arms and eight tentacles. The tentacles are able to reach up to ten meters in length. The oral arms can grow to be four to five meters in length. The arms are used for moving food into the stomach area. Cnidocytes cover the tentacles, oral arms, exumbrella, and gastric pouches that eject toxin-filled stinging threads. The sting of the tentacles are not fatal but can be very painful. The only difference between thr male and female sexes are the thickness of the follicles. Purplestriped jelly are bioluminescent (able to produce light). The light is a green  or purplish color  that does not last long and fades gradually. The light is formed when the jellyfish is disturbed. Although scientists are not quite sure how the light is formed, it is likely controlled by the nervous system. The stages of development for the purplestriped jelly goes Planula larva to ephyra stage to medusa. They have no sessile polyp stage. The jelly stays an egg for three days and then grows into a planula. After seven days the jelly then grows to be a ephyra and after a month the jelly finally develops into a medusa. 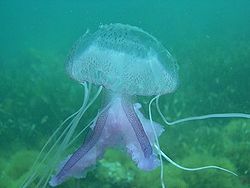 When the jellyfish is young, the bell is a light pink color and does not have the distinct stripes that the adult does. Purplestriped jellyfish are what tend to scare tourists away from the beaches. Fishermen are hurt by the jellyfish. In France the jellyfish have burned holes into nets. ↑ 1.0 1.1 1.2 1.3 Jellyfish Resources By Author Unknown, Purple Jellyfish page, Accessed November 21, 2010. ↑ 2.0 2.1 2.2 2.3 2.4 2.5 Absolute Astronomy By Author Unknown, Pelagia noctiluca page, Accessed November 17, 2010. ↑ 3.00 3.01 3.02 3.03 3.04 3.05 3.06 3.07 3.08 3.09 3.10 3.11 Marine Invertebrates of Bermuda By Lauren Thomas, The Cephalopod Page, Accessed November 16, 2010. ↑ 4.0 4.1 Monterrey Bay Aquarium By Author Unknown, Purple-striped jelly page, Accessed November 17, 2010. ↑ 5.0 5.1 5.2 5.3 Animal diversity web By Erin Leverenz, Pelagia noctiluca purplestriped jelly page, Accessed December 9, 2010. ↑ Susanscott.net By Susan Scott, Open ocean jellyfish glows in the dark page, June 7,1999. ↑ 7.0 7.1 7.2 World Enviornment By Author unknown, Billions of jellyfish wipe out salmon farm page, November 21, 2010. ↑ Zipcodezoo By Author unknown, Pelagia noctiluca(Purplestriped Jelly)page, Accessed December 7, 2010. ↑ Oceanic Research and Publishing Ltd By Author unknown, purple stinger page, Accessed December 9, 2010. ↑ Oceana Protecting the World's Oceans By Author Unknown, Mauve Stinger Pelagia noctiluca page, Accessed December 9, 2010. ↑ 11.0 11.1 11.2 Wikipedia By Author unknown, Pelagia noctiluca page, December 1, 2010. This page was last modified on 26 December 2010, at 21:08.